Bury Markets - Bury Market Shortlisted in National Coach Tourism Awards. Bury Market Shortlisted in National Coach Tourism Awards. Bury Market could be in line for another prize, this time in the National Coach Tourism Awards 2016. The town's famous attraction has been shortlisted for the coach friendly shopping destination of the year, and will compete against Ashton-under-Lyne Market, Blackburn Markets, Huntley's Country Stores and Oswaldtwistle Mills for the honour. Bury has previously won the award, in 2014. 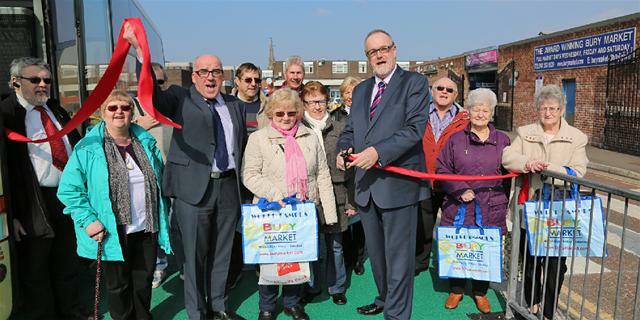 Andrew Heyes, Bury Markets manager, said: "The market is a huge tourist draw, bringing in coach parties from across the North West and far beyond - in fact, last year some 1,500 coaches came here to experience the unique experience that is Bury market. "We have made a range of improvements to keep the market attractive to shoppers, such as new public toilets and, particularly in this context, a coach dropping-off point to make it easier for visitors to get here. We're keeping our fingers crossed for another award!" Stuart Render, editor of Coach Monthly, said: "There are many tourism awards, but only the National Coach Tourism Awards specifically focuses on coach tourism. That's the key reason why this awards scheme continues to attract high levels of support from across the industry."